Enjoy this overnight tour of Uluru (Ayers Rock) and Kata Tjuta (Olgas) departing daily from Ayers Rock Airport or Ayers Rock Resort (Outback Pioneer). 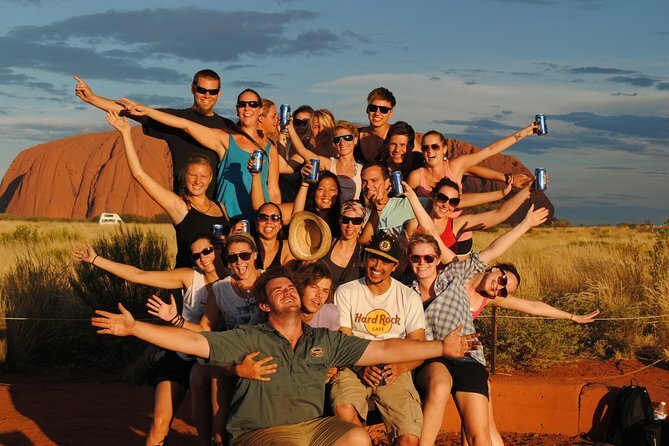 This tour includes Uluru Sunset, Sunrise, the Base walk and the Cultural Talk. You will also visit Kata Tjuta for the Valley of the Winds walk and you sleep in under the stars in a swag at Ayers Rock Camping gound. You will be picked up after 11:30am from either Uluru (Ayers Rock Airport) or the town of Yulara at Outback Pioneer (Ayers Rock Resort). Enjoy lunch and visit the Aboriginal Cultural Centre where you can learn about the Dreamtime, before starting your Uluru Base Walk. Take in the spiritual significance of Kantju Gorge, Mutijulu Waterhole and Aboriginal Cave paintings before a guided Mala Walk before sunset on Uluru, where you will have dinner. Spend the night camping under the stars at the Ayers Rock Camp Ground in swags with hot showers and toilets. Tents are available. You can be dropped off at 10:45am at the Uluru (Ayers Rock Airport) if you have a flight out on day two. You can also be dropped off at the town of Yulara (Ayers Rock Resort) at 10:45am if you want to spend another night at Ayers Rock. Free Airport Shuttles operate every hour from the Outback Pioneer YHA to the Ayers Rock Airport if you wish to spend the night and fly out of Ayers Rock on Day 3. Thanks to our tour guide Laura, she has done a amazing job for our group of 24 people, we had enjoyed our trip.